This new book on the history of contemporary Trotskyism is the first of its kind. It is commendable for a major publisher like Routledge to produce such a book. It is a well researched to a point and a scholarly work. Having said this other reviews of this book have pointed out that it is a bit rich for an avowed Stalinist to write a book on the history of contemporary Trotskyism. A member of the British Communist Party during the 1980s Kelly still seems to have kept all the ideological baggage of his membership. His political friends in the Stalinist Morning Star agree with his task stating, “It is an almost impenetrably confusing picture, which the author does his best to unravel. It's a laborious task given the characteristic sectarian feature of Trotskyite organisations, resulting in frequent splits and divisions at both a national and international level. One striking aspect of the few reviews that have appeared so far in the Pseudo Left press is their mild criticism of an author who is ideologically hostile to Trotskyism. Any serious Trotskyist organisation would have to defend its ideas from this type of hostile source. Ian Birchall, a member of the SWP, perhaps sums up the complacent and defensive attitude towards Kelly and his downplaying of the possibilities of any Trotskyist group leading a revolutionary struggle “Now it looks very unlikely that any of the small groups (what the French used to call groupuscules) described here will lead a revolution. But for all that, I don't think it was just a waste of breath. For our generations Trotskyism, at its best, was the form taken by what the American Marxist Hal Draper, in his magnificent pamphlet The Two Souls of Socialism, called ‘socialism from below’ – the belief that socialism, if it comes, will be the product of the self-emancipation of ordinary working people through mass action; it will not be the result of relying on elected representatives or liberation by ‘progressive’ armies. What form it will take in the future cannot be predicted, but history always works by continuities as well as ruptures, and somewhere amid the acres of print that Kelly has scrutinized, the spark of human liberation still lives”. Birchall is supported by another SWP member Joseph Choonara who writes “It should also be said, it is hard for me to hate a book that portrays me as an instance of “younger members” reaching “leading positions” in the Trotskyist movement (even if I have “done little to disturb oligarchic rule”). Kelly’s main problem is that his conception of Trotskyism is heavily influenced by his Stalinism. His understanding of its history is limited and as we shall see later in this review coloured by his politics. According to Kelly, it is only when Trotskyist organisations ditch their program and history do they achieved some limited success. He writes: “The paradox of those success stories is that they were achieved precisely because Trotskyist groups set aside core elements of Trotskyist doctrine and focused on building broad-based, single-issue campaigns around non-revolutionary goals.” The whole focus of the book is given over to try and persuade the Trotskyists not to be Trotskyists. Kelly damns Trotskyism for not building “a mass Trotskyist party anywhere on the planet or led a socialist revolution, successful or otherwise”. It is according to Kelly a “rigid and unhelpful doctrine” and has a “millenarian, revolutionary vision”. This theme of not leading a socialist revolution runs through the entire book. Two things strike one when reading the above comments. Firstly as Kelly conveniently leaves out is that capitalism has survived in no small way thanks the to the betrayals and treachery of the party that he belonged to. Secondly it is just not true that Trotskyists have not led significant struggles throughout the 20th and 21st centuries. If Kelly had bothered to interview some orthodox Trotskyists of the SEP, he would have found this out. His ideologically driven flippancy also leads him to underplay the enormous internal struggles the Trotskyist movement has gone through which in many respects were, in fact, life and death conflicts which impacted on the lives of millions of workers around the globe. Three significant struggles come directly to mind. The first being James P Cannon and Gerry Healy’s opposition to Pabloite revisionism leading to issuing of the Open Letter and the founding of the ICFI(International Committee of the Fourth International in 1953. Secondly Healy’s defense of Trotskyism against Cannon’s reunification with the Pabloites in 1963. Thirdly David North’s struggle against the Betrayal of Trotskyism by the WRP(Workers Revolutionary Party) 1984-85. These tremendous political conflicts have little interest for Kelly. A fact represented in the low coverage they received in this book. Another theme running through Kelly’s book is his obsession with the size of the Trotskyists parties and the fact that there are so many. If Kelly had bothered to do a little more research and drawn from history namely the Russian revolution he would have found out that the Bolsheviks were small, tiny in fact at the beginning and they led a successful revolution. While it could be said that Kelly is hostile to all Trotskyist parties he has a particular distaste for the parties that make up the ICFI (International Committee of the Fourth International). In perhaps the most accurate statement of the whole book, he identifies the SEP (Socialist Equality Party) as orthodox Trotskyists. He sarcastically writes in a true Stalinist style that despite having only 50 members it is “the sole political tendency on the face of the planet that sets as its aim the revolutionary mobilisation of the working class against imperialism”. Kelly as already has been mentioned is incapable of understanding the history of the different tendencies. Either Kelly has not done enough research or most probably due to his Stalinist politics he does not care. This forces him to come up with ridiculous names for the different parties, like “institutional Trotskyism”, “Third Camp Trotskyism”. Kelly’s idea behind these strange names which have no history in the Trotskyist movement is to belittle these groups to be shunned like religious sects. Kelly believes that Trotskyism has been isolated from the mass workers movement because of its almost religious-like adherence to principles and perspective. However, this so-called isolation is coming to an end. With the collapse of the old organisations including his own there has developed a changed relationship between Trotskyism and the working class. A point made by the ICFI when it correctly predicted “the collapse of the Soviet Union in 1991 and the irrevocable discrediting of Stalinism, together with the political bankruptcy of the social-democratic and reformist parties and trade union organizations, would lead to a fundamental change in the relationship between the Trotskyist movement and militant sections of the working class and youth, radicalized by the deepening crisis of American and world capitalism”. It is quite striking that all Kelly draws from the centenary year of the Russian Revolution, in his introduction is that the Trotskyist movement has not led a revolutionary struggle anywhere in the world so why would they celebrate this revolution.If Kelly had bothered to leave his cloistered university in London, he would have found some struggles that involved the Trotskyists in a significant way. Another thing that needs to be challenged by Kelly’s introduction is that the “Stalinist terror” was a product of the October Revolution. This lie has been peddled by academics sympathetic to Stalinism for decades. It must be said that Kelly has approached the subject of contemporary Trotskyist from an entirely nationalist viewpoint. Perhaps one of the most critical discussions to take place inside the worker's movement was the struggle found a section of the Fourth International in Britain on an international basis. The most critical disagreement during the early years of British Trotskyism was the struggle over the acceptance of the international perspective from a national perspective. As Trotsky wrote in 1938, “The present conference signifies a conclusive delimitation between those who are really IN the Fourth International and fighting every day under its revolutionary banner, and those who are merely ‘FOR’ the Fourth International, i.e. the dubious elements who have sought to keep one foot in our camp and one foot in the camp of our enemies... Under the circumstances, it is necessary to warn the comrades associated with the Lee group [the WIL] that they are being led on a path of unprincipled clique politics which can only land them in the mire. It is possible to maintain and develop a revolutionary political grouping of serious importance only on the basis of great principles. The Fourth International alone embodies and represents these principles. It is possible for a national group to maintain a consistently revolutionary course only if it is firmly connected in one organisation with co-thinkers throughout the world and maintains a constant political and theoretical collaboration with them. The Fourth International alone is such an organisation. All purely national groupings, all those who reject international organisation, control and discipline, are in their essence reactionary.”This struggle receives scant attention in Kelly’s book. Kelly asks this question can “Trotskyists often describe their organisations as revolutionary vanguard parties built on the principles of ‘democratic centralism’ whose political aim is the destruction of the capitalist state and the capitalist mode of production “. Having not been in a revolutionary party it is beyond Kelly’s comprehension to understand that these parties are unlike any other party on the planet. Not only from an organisational point of view but more importantly from a perspective standpoint. While accepting to a certain extent that Trotskyist parties are different from mainstream bourgois parties he goes on to slander these organisations believing they are akin to religious sects who insist in upholding a doctrinal purity. Given that Kelly belonged to a party that in the past took its daily perspective from Stalin who murdered more Bolsheviks than the Nazis and betrayed more workers struggle than any other organisation it is a little rich for Kelly to try to take the political high ground. It is also extraordinary that in this chapter Kelly has little to say on the history of his own Communist Party. He might want to note that the betrayals carried out by his organisation would have something to do with the isolation of the Trotskyists from the mass workers movements. These betrayals were done in the name of the October revolution and discredited 1917 in the eyes of many workers. 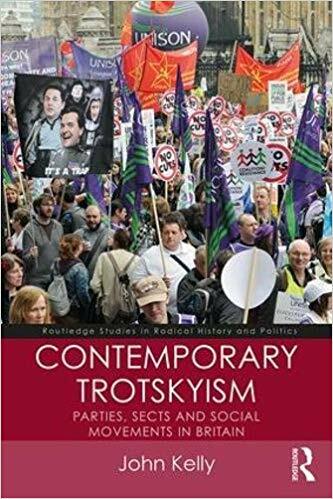 In this chapter Kelly questions whether the contemporary Trotskyists group can describe themselves as the continuation of Leninism or Bolshevism, primarily because Trotsky changed his position on many issues. In academia when someone makes such a statement like that it is standard practice to back up such a statement with proof. Kelly does not do this, Why, because to do this he would have to explain his hostility to Trotsky and his politics. Kelly repeats some slanders of Trotsky’s position that have been the stock and trade of academics who have perpetrated a “Post-Soviet School of Historical Falsification. As Wolfgang Weber explains “after the collapse of the Soviet Union, historians of this school—including Dmitri Volkogonov (Russia), Richard Pipes (US), Geoffrey Swain and Ian Thatcher (both UK)—rehashed the old Stalinist lies and falsifications about Trotsky to cut off the younger generation from the ideas of the most consistent Marxist opponents of Stalinism”. While these two chapters cover a significant amount of history, it is nonetheless surprising that Kelly says next to nothing about the 1940s. The 1940’s are instrumental in understanding the subsequent trajectory of all the groups in Britain and internationally. To discuss the years 1950-1985 in chapter three and then in chapter four 1985-2017 would be a big ask for anyone. To say that Kelly’s analysis is simplistic would be an understatement. Kelly does not devote enough care and attention to the complex issues that confronted the Trotskyist movement during this time. The treatment of the SLL/WRP again reveals his political bias and does not contain a shred of objectivity. His treatment of the complex expulsion from the WRP of Alan Thornett is a case in point. To Kelly, this was just a power struggle between Healy and Thornett. If Kelly had bothered to consult the documents of the Split in the WRP 1985 produced by the ICFI especially How the WRP Betrayed Trotskyism he would have given his readers a far more balanced understanding. As the above documents state “It was the height of political duplicity for Thornett to conspire against his own Party and then denounce the leadership for violating the constitution. Healy, who then had accumulated 45 years of experience within the communist movement, could recognise an anti-party clique when he saw one. However, it is another matter entirely whether the leadership was politically wise in acting to expel Thornett on organisational grounds before an exhaustive discussion of the political differences, regardless of their origins. This is not a question of being wise after the event. The Trotskyist movement had, before Thornett emerged on the scene, acquired a great deal of experience in dealing with unprincipled minorities — of which the most famous was the Shachtman-Burnham-Abern tendency. Experience has taught the Trotskyist movement that the political clarification of cadre must be the overriding priority in any factional struggle — even one involving a disloyal clique”. Also in these chapters, Kelly wastes an inordinate amount of space on what it means to “assess trends in the membership of the Trotskyist movement over time”. The purpose of the constant fixation with size is to belittle the importance of the Trotskyist movement and to discourage a severe examination of program and history. It is debatable how much Marx, Engels, Trotsky, Lenin Kelly has read. Clearly, from this chapter, it is not enough. The early Marxists understood very early that program builds the Party. From Marx’s time, orthodox Marxists have attached the highest importance in defending the Marxist method and program from attack by revisionists of all sorts. Kelly calls this defense doctrinaire and sectarian. It must be said that the Trotskyist movement has survived greater insults than Kelly can produce. There is nothing new in Kelly’s stance. The Stalinists have been attacking Trotskyist conceptions since the late 1920s. Kelly is just rehashing their political positions and slanders. In this chapter Kelly’s again berates the Trotskyist movement for its low membership. At no point does Kelly offer his understanding of what happened to the Labour Party and Communist Party politically regardless of whether they have grown or declined. Both of these organisation are organically hostile to the building of a revolutionary party and have spent their entire existence trying to prevent the growth of such an organisation. Throughout his career, it would seem Kelly has been heavily critical of Trotskyist parties such as the SEP for not ditching their “ doctrinal” attitude towards elections. In his article Upbeat and the margins: the British Trotskyist Left and their exceptionally poor election results he states “The extremely poor electoral performance, therefore, created a significant dilemma for these party leaders. On the one hand, an open acknowledgement of an extremely poor vote implies there is very little support for their programmes and potentially calls into question their main policies, and possibly their core ideology. Moreover, an open admission of unpopularity could threaten the positive attachment of activists to their respective parties. On the other hand, the denial of poor electoral performance or indeed claims that it constitutes some form of success, 1/3 potentially threaten the credibility and authority of the party leaders. The research was therefore undertaken to understand how Trotskyist party leaders constructed accounts of their electoral performance which identified positive achievements in the face of meagre vote shares”. Kelly’s article shows some things. Firstly Kelly has no faith that Trotskyism can win the working class to its banner with a revolutionary program. They should as Stalinists down the years have been advocating ditch building a revolutionary party and concentrate on electoral politics. Failing that Kelly encourages groups to liquidate their parties and work within front organisations which many Pseudo Lefts groups have all in but name done. Kelly correctly states that “Trotskyists have always attached enormous importance to working inside the trade union movement because of the belief that it represents the most organised and class-conscious section of the working class “. As Kelly intimates, the trade union questioned has been a vexing issue for the Marxist movement. For Kelly, the issue is straightforward; he is uncritical of the trade union leadership. He cannot understand why orthodox Marxists are profoundly critical of the trade leaderships betrayal but have reservations about the very organisations themselves. As David North from the SEP states “In the history of the Marxist movement, there are two political issues, or “questions,” that have been the source of exceptionally persistent controversy, spanning more than a century. One is the “national question”, and the other is the “trade union” question”. One would think that there is something to be learned from so many unfortunate experiences. But like the old fools found in the tales of Boccaccio, the ageing and toothless radicals today are only too eager to play the cuckold again and again. Thus, the present-day “left” organisations still insist that the socialist movement is duty-bound to minister loyally to the needs and whims of the trade unions. Socialists, they insist, must acknowledge the trade unions as the worker's organisation par excellence, the form most representative of the social interests of the working class. The trade unions, they argue, constitute the authentic and unchallengeable leadership of the working class — the principal and ultimate arbiters of its historical destiny. To challenge the authority of the trade unions over the working class, to question in any way the supposedly “natural” right of the trade unions to speak in the name of the working class is tantamount to political sacrilege. It is impossible, the radicals claim, to conceive of any genuine workers movement which is not dominated, if not formally led, by the trade unions. Only on the basis of the trade unions can the class struggle be effectively waged. And, finally, whatever hope there exists for the development of a mass socialist movement depends upon “winning” the trade unions, or at least a significant section of them, to a socialist perspective. To put the matter bluntly, the International Committee rejects every one of these assertions, which are refuted both by theoretical analysis and historical experience. In the eyes of our political opponents, our refusal to bow before the authority of the trade unions is the equivalent of lèse-majesté. This does not trouble us greatly, for not only have we become accustomed, over the decades, to being in opposition to “left-wing” — or to be more accurate — petty-bourgeois public opinion; we consider its embittered antipathy the surest sign that the International Committee is, politically speaking, on the correct path”. Chapter 11 The proliferation of Trotskyist Internationals. The problem with this chapter like all the rest of the book Kelly presents large numbers of statistics but very little analysis of how the different Trotskyist groups started out and where they have finished. Like I said earlier there is a reason why Kelly does not in any detail discuss not only the international origins of the Fourth international but its origins in Britain. Everything Kelly examines he does so from a nationalist standpoint point. How could it be any different? He is, after all, a Stalinist. Anyone reading this chapter would be better off closing the book and purchase a copy of the newly updated history of the Fourth international called The Heritage We Defend by David North. It is a positive thing that a major publishing house publishes a book of this type. While recommending this book, I would draw readers attention to the above book by North which should read first or at least side by side with this book. Despite its significance, in the end, it is sad, but Kelly’s book is but another from the Post Soviet School of Falsification.